Sable Maze: Sinister Knowledge is rated 3.5 out of 5 by 11. Rated 5 out of 5 by jazzy532 from Love IT!!! I love these Sable games, they are so much fun, I cannot believe my luck when another game came out. Fantastic, I like to collect games, And sable maze is one I collect, I love to play them over again. Rated 5 out of 5 by a325zx from Great Game! I thought this a fun game. 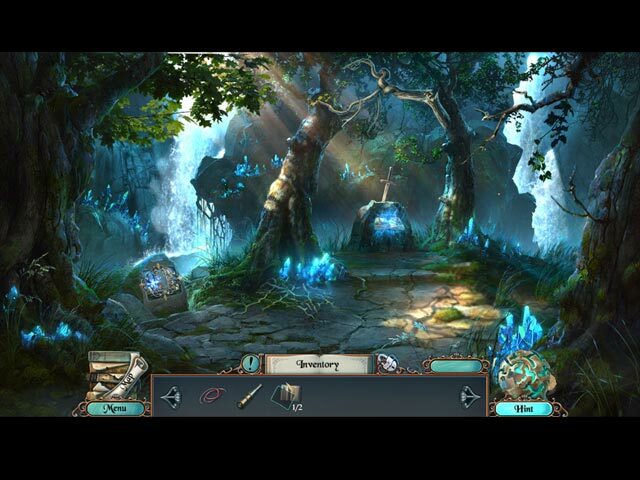 It offers many puzzles and the graphics are excellent! I love the fantasy scenes and music! Rated 4 out of 5 by denniann2 from a pretty good game in the series it has 4 levels to play on. i used custom. good hint system. you are trying to figure out what is going in this town adn yhou trying to beat the enemy that wants to rule the world with old tomes that trap threats in them. you need to recover them and ensare the threats and deal them back up before your enemy does. Rated 4 out of 5 by Aliana_4711 from Pretty easy, nicely visualized, too short. My rating is based on playing the entire SE. It meets most of my requirements. I played w/o hints. Four stars because of high quality and really fanciful locations. To rate with five stars rating, it should have been more challenging and not that short. - Story: Mystery story. As a literary historian you’re the last hope to find long missing tomes. It happens to be more dangerous than you thought. Your client turns out to be a villain, who wants to rule the world. Quite ambitious, isn’t it? But with the tomes, all can be possible. Find and seal them. Quick. - Difficulty can be customized partly. Tutorial, sparkles, map issues, glitter, contextual pointer, plus item indicator, penalty and hint / skip recharge. Helping texts can’t be excluded. - Graphics/locations: pretty, detailed, rich in variety. - Animation and voice-over: well done. - Music: Mostly unobtrusive, fitting. Sometimes sinister. - Tools: you have an interactive map only. - HO’s: Interesting, nicely done, interactive, descriptions, silhouettes… Easy. You can switch to a match3 mode. - Mini games: quite easy. Nothing new, but pretty well crafted. - Adventure part: almost logical. Per tome you have to solve puzzles in ca 5-7 locations. To do’s are obvious. - Length: I needed about 3 1/2 hours for completing. Rated 4 out of 5 by deddu from FUN ADVENTURE THROUGH BOOKS I enjoyed going through the library as I love books. The hidden objects were varied: putting together different items, finding two of the same, and finding one item and linking it to another. You can also switch to match 3. The puzzles were not hard. The graphics are good and the voice overs for the most part are fine. Rated 4 out of 5 by pennmom36 from Knowledge Is The Key Rumor has it that the McCordan Library contains a hidden library somewhere amongst Lars McCordan's vast collection of fine literature. This secret bunker allegedly contains 5 very valuable Tomes, deemed too dangerous to fall into the wrong hands! Lars was a member of The Secret Society Of Tomb Keepers, who vowed to protect the Tombs, but Lars has been missing since 1930! The McCordan estate was eventually auctioned off, and purchased by Colin Englund, who will stop at nothing to find the secret library, and the 5 dangerous Tomes! Mr. Englund has hired you, an accredited literary historian, to witness the unveiling of this magical library. Mr. Englund has been unsuccessful at disarming the vast locks and traps that protect the secret library, but Mr. Englund may be just as dangerous as the Tomes themselves! I really enjoyed this game and bought the Collector's Edition immediately after the demo ended, and I might add that the game will hold your interest after the demo as well. The graphics are very realistic, at least as realistic as it can be considering the book's characters have just come to life. The Collector's Edition version offers Collectible Coins that are used to purchase different storybook characters (and game characters) Morphing Jigsaw Puzzle Pieces, that you can assemble and set as a Screensaver, and of course, Achievements to earn for different milestones. 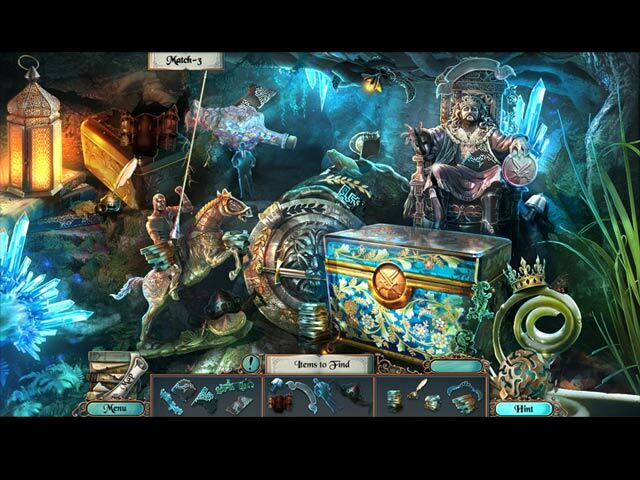 The Hidden Object Scenes are varied, nothing really new or exciting, but they aren't bad either. You can opt to play a Match 3 game if you're not into the hop. There are Interactive List finds, Interactive Progressive Silhouetted Shape finds, and even FROG's, one of my personal favorites. There are also several Zoom Zone's that have Multiple Item finds and each time you "travel" to a new book genre, you must first find several torn picture fragments within the entire scene, and reassemble them together. This is super simple because there are outlines of each piece displayed. The Mini Games are pretty good. I will admit that several of them have a feature that drives my bonkers (moving on one affects others) but for the most part the games aren't too difficult. Below are brief descriptions of some of the games you'll encounter during the demo as well as a few memorable ones from the main game: 1) Arrange the symbols in the correct order. 2) Spot the difference in three different pictures. 3) Turn over the stones so that all symbols are visible, clicking on one stone may affect others. 4) Place items in the scene correctly. 5) Select the bells until the image on the bells are the same as the image above them, selecting one bell may affect others. 6) Rotate the circles to the correct positions and then select the tiles to position them. 7) Help the horseman reach the castle by finding and using the correct items to overcome obstacles along his path. 8) Pull the chains to the correct heights, pulling one chain may affect others. 9) Rotate the circles to their correct positions. 10) Paint the image according to the clue. Select the areas you want to paint and then select the color at the top. Only adjacent selected areas will be painted. 11) Move the token to the other side, you can only move forward to a highlighted area. 12) Move every token to it's correct place. (lengthy but fun) 13) Restore the image by sliding puzzle squares to an empty slot. 14) Reconstruct figurines by selecting free fragments and moving them to either an empty space or stacking them. The Collector's Edition has 19 Developer Diary pictures, 16 Concept Art pictures, 10 Wallpapers, Morphing Jigsaw Puzzle Pieces to create 6 different Screensavers, 5 Music Soundtracks, Collectible Coins to purchase 8 Character figures, 6 levels of Tome-Maze puzzles, 15 Achievements to earn, a built in Strategy Guide and a Bonus Chapter, enjoy! Rated 3 out of 5 by flowercrazy40 from too short I paid for this game and as soon as I did it was over. way too short. Rated 3 out of 5 by emeraldorchid from Questionable ending but no spoilers I actually really liked this game, I didn't find it slow paced, but then I always take my time when playing instead of rushing through. I thought the story line was acceptable and not too far fetched. ( though I do love fantasy stories) My only problem with the game was that it let me finish the ending while still having several items in my inventory. The story is not that good for me to play it again to see what happened, but I walked into the last area expecting to get more info on the "bad guy". But since I had one particular item, it thrust me right into the end. Done, but not completed as i like to play. Was a let down for me and therefore less stars. So, try the demo, as I said I did enjoy the game, until the end. And this is more of a warning to check your inventory before entering the last room and engaging in any conversations. Enjoy! Rated 3 out of 5 by biscuitsmama from A VERY SLOW PACE GAME THAT NEEDS A BOOST OF ENERGY You’ve been commissioned by Colin Englund founder of the Hullbright Institute of Literature to examine some antiquities but as always this might not be easy since the tomes were hidden and you must find them first. Oh, yes there is more! It seems that the estate of Lars McCordon is full of puzzles and traps that must be disarmed before you can begin your search. Alas, just another day in HOPA land – lol. The graphics are much better than usual for this developer and, thankfully, do not heavily rely on varying shades of purple. The voice overs were good but the characters seemed almost cartoonish. There is a transporter type map that has sections added to it as needed once you enter the library. There is an interesting variety of HOPS including a FROG scene early in the game. Most HOPS are interactive and interactive, but I don’t particularly care for silhouette scenes and Sinister Knowledge seems to have an abundance of them. As is generally the case, the puzzles range in difficulty; however, many of them are not the types of puzzles that I particularly like and it seems like I spent a lot of time spinning or pulling various items to gain my prize or entry into an area. One puzzle I did enjoy early in the game involves placing items around a circle by following their correct path from beginning to end – much better than those toggle type puzzles. 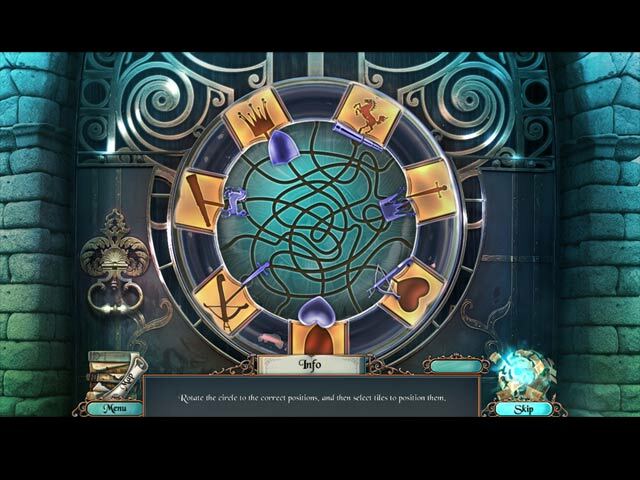 The CE version includes morphing puzzle pieces that are used to complete six puzzles, collectible coins that are used to purchase statues of the game’s characters, and achievements to earn. The remainder of the package is fairly standard. Not the most stellar CE package but better than some. 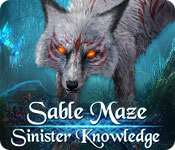 I must admit that I have enjoyed most of the Sable Maze games so I don’t know why I am not enthused about Sinister Knowledge. I felt the game was very slow and seemed to go nowhere fast. I don’t particularly care for games based on the “enter a book” theme and, IMHO, some others have been done far better than Sinister Knowledge. The story is rather predictable and then with puzzles that I don’t like, it makes the game a bore for me. I know there are many gamers who will find this game absolutely wonderful but I am not one of them. Even though I don’t care for the game, as always, please try the demo to see if this is a game you will enjoy. Rated 2 out of 5 by FurbyFarmer from Just Finished This Game... I actually feel relieved that it's over. The puzzles were super easy and soooo boring. The idea behind the storyline was good, but the execution was not. I'm going to delete it from my hard drive so I don't accidentally go to play it again in the future.